The 2019 Grand National takes place on April 4th and is the world’s most famous steeplechase. The contest takes place over a gruelling four mile, two-and-a-half-furlong course, and requires stamina, plenty of jumping ability and a little bit of luck. Important info:18+. UK+IRE only. Promo code 'G30' required. Min first bet £10. Must be placed within 14 days of account reg. 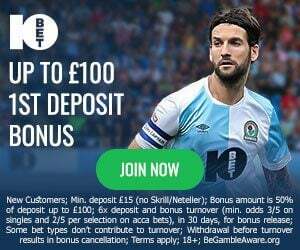 £30 credited as 3 x £10 free bets. Not valid with CashOut. Free bet valid for 4 days.T&Cs Apply. The action begins at Aintree on April 4th with a number of terrific races acting as a precursor to the showpiece event including the Aintree Hurdle and the Topham Chase. Here at BettingTop10 we’ve compiled a guide to the big race, the latest odds for the energy-sapping contest and a guide on where to find the latest offers and promotions from the UK’s best online betting sites. We focus on how to place a bet, where to find the best prices and how to follow all of the action across the three days. Win Bet – This is the simplest way of betting on the 2019 Grand National and simply requires you to pick the winner of the race. There are 40 runners tackling the Aintree fences and the stamina-sapping contest can be hugely unpredictable. The returns for correctly selecting the winner are extremely appealing with previous victors returning prices such as 16/1, 33/1 and 100/1. The selected horse MUST finish in front of all other participants in order for a win bet to successfully land. Many punters split their stakes across a number of different runners and this helps narrow down the field. Each-Way – The most popular way of betting on this fixture is each-way. This allows a little more leeway and horses who finish in the top four in order will help you secure some kind of return. Playing each-way requires double the stake, but it can be hugely profitable if your horse places at big odds. For example, a £10 each-way wager will cost £20 – £10 on the horse to win, £10 on the horse to finish in the top four positions. If the horse wins at odds of 16/1, you will receive £160 + your stake. It’s always advisable to check beforehand and make sure you shop around, but place terms are generally ¼ for the first four places so if your horse occupies one of those positions, it is calculated as 16/1 divided by 4 = 4/1. £10 x 4 = £40. You will make £40 profit if your horse places. Many online bookmakers in the UK will increase their place positions for the big race and it is not uncommon to see some operators offering the first five or six places for each-way bettors. This gives punters an extra opportunity to find some big-priced runners. It is straightforward to place an online bet ahead of the 2019 Grand National and there are a number of online bookmakers who offer outstanding welcome offers and promotions for all new customers and many of these can be used on the big race. Most online betting sites will have the Grand National odds priced up months in advance and the majority of them will advertise the latest odds on their homepage. Simply browse the market and select your chosen horse. If you wish to place an each-way bet, tick the small box next to the stake and this will ensure you’re covered for the first four places. The Grand National betting market is always hugely competitive and the prices on several of the runners are likely to change during the build-up to the contest. Most runners will go off 10/1 or bigger and previous winners have returned prices of 33/1 and 16/1. There is always value to be found. The first day is commonly known as Grand National Thursday and takes place on April 4th, 2019. There are seven races on the card, five of which are graded. It raises the curtain at the course and kicks-off three days of outstanding National Hunt action. The feature race is the Aintree Hurdle which is a Grade 1 contest competed over two miles and four furlongs. The second day at Aintree is known as Ladies Day and takes place on April 5th, 2019. It focuses on both fashion and racing and is hugely popular with locals. It adds plenty of glamour to proceedings and is one of the most anticipated events on the social calendar in Liverpool. There are seven terrific races on the card including the listed Topham Chase which is competed over two miles and five-and-a-half furlongs. Grand National Day concludes the three-day extravaganza and provides five graded races alongside the world-famous steeplechase. The big race itself goes off at 5.15pm and a bumper crowd is expected to be in attendance. William Hill – William Hill offer all new customers a £30 free bet when they sign-up for an account and this can used to bet on the Grand National. Their offers include Bet Boost which allows customers to enhance their returns (one per day) and mobile app users will receive an extra daily boost on every live ITV race with the broadcaster showing all three days of the meeting. #YourOdds also allows customers to create their own bets on the race and there are a number of examples already available on the site. Paddy Power – New customers at Paddy Power will receive a risk-free £10 bet which can be used on the Grand National or any of the racing from Aintree. PP are also one of the few online bookmakers who are generously paying out on the first six places and this is a great way of potentially landing an each-way return. They are also offering a number of money-back promotions throughout the first two days of the Aintree Festival including money-back if the SP favourites win any of races on Ladies Day. Risk Free 20: New customers only, limited to one per person. If you’ve previously had a Paddy Power account, you will not qualify for the offer. Place your FIRST bet on any Sportsbook market and if it loses we will refund your stake in CASH. Max refund for this offer is £20. Only deposits made using Cards or Paypal will qualify for this promotion. T&Cs apply. Paddy’s Rewards Club: Get a £10 free bet when you place 5x bets of £10+. T&Cs apply.